To claim this profile, please confirm you are Ariana Moralez. To follow this profile, please let us know your relationship to Ariana Moralez. Girls varsity basketball vs. Salam. Girls varsity basketball vs. USM. Girls varsity basketball vs. RCCHS. Girls varsity basketball @ Destiny. Girls varsity basketball vs. EVAE. Girls varsity basketball @ RCCHS. Girls varsity basketball @ Stockbridge. RESULTLoss Girls varsity basketball @ WSD. The Eastbrook Academy varsity basketball team lost Tuesday's away conference game against Wisconsin School for the Deaf (Delavan, WI) by a score of 29-28. RESULTLoss Girls varsity basketball @ Salam. The Eastbrook Academy varsity basketball team lost Tuesday's away non-conference game against Salam (Milwaukee, WI) by a score of 39-24. The Eastbrook Academy varsity basketball team lost Tuesday's home non-conference game against HOPE Christian (Milwaukee, WI) by a score of 71-26. No result has been reported for the Eastbrook Academy varsity basketball away non-conference game @ TBA. The Eastbrook Academy varsity basketball team won Thursday's neutral non-conference game against Washington (Milwaukee, WI) by a score of 42-20. 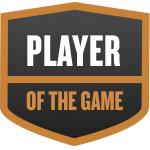 Ariana was selected the Player of the Game in the basketball game against Early View Academy of Excellence on Tue, Dec 11 2018. Ariana was a floor general and lead the team in scoring steals and second in rebounds. Ariana's basketball stats have been updated for the win @ Early View Academy of Excellence. RESULTWin Girls varsity basketball @ EVAE. The Eastbrook Academy varsity basketball team won Tuesday's away conference game against Early View Academy of Excellence (Milwaukee, WI) by a score of 55-10. RESULTWin Girls varsity basketball @ ULTA (CO-OP). The Eastbrook Academy varsity basketball team won Wednesday's away non-conference game against University Lake/Trinity Academy (Hartland, WI) by a score of 26-24. Ariana was selected the Player of the Game in the basketball game against Washington County HomeSchool on Mon, Dec 03 2018. Lead to team to victory just 4 rebounds shy of a 2nd straight triple double. Ariana was selected the Player of the Game in the basketball game against Cristo Rey on Fri, Nov 30 2018. Recorded the teams first triple double and lead the team to first win of the season. Ariana was selected the Player of the Game in the basketball game against Salam on Thu, Nov 29 2018. Lead the team in scoring and steals and was key to closing the lead.